A mouse looked through the crack in the wall to see the farmer and his wife open a package..
What food might this contain? The mouse wondered - he was devastated to discover it was a mousetrap. Retreating to the farmyard, the mouse proclaimed the warning : There is a mousetrap in the house! There is a mousetrap in the house! That very night a sound was heard throughout the house -- like the sound of a mousetrap catching its prey. The farmer's wife rushed to see what was caught. In the darkness, she did not see it was a venomous snake whose tail the trap had caught. The farmer's wife did not get well; she died. So many people came for her funeral, the farmer had the cow slaughtered to provide enough meat for all of them. The mouse looked upon it all from his crack in the wall with great sadness. Merry and Blessed Christmas 2008!!! 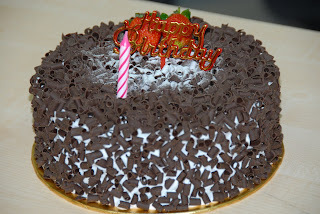 Apologies for the lack of posts, CSSUCSI.blogspot.com promises for an exciting New Year 09! Jesus is the REASON, for this SEASON! CSS UCSI may have slowed down a little over the last month..but don't worry! Well, there's a surprise (your very own CSS Christmas present) coming your way! So just keep on checking the blog for more info within the next few days!! PHILADELPHIA, Pa. (The Catholic Standard and Times) - Samuel Masih was a simple street cleaner. One day, while cleaning a garden in Lahore, the twenty-seven-year-old Pakistani Catholic was accused of deliberately piling garbage against the wall of a mosque. He was arrested and thrown in jail, where he was repeatedly tortured for his faith. While being treated for tuberculosis, which he contracted in prison, a police constable decided to earn a place in Janna’ (Paradise) by killing him with a brick-cutting hammer. Thousands of miles away, on a beautiful mid-August day, thirty-two-year-old Fr. Jesus Adrian Sanchez was giving religious instruction at a school in the rural area of Chaparral (Tolima), Colombia. An armed man burst into the classroom, ordered him outside, and shot him dead. Deep in the Brazilian rainforest, a seventy-three-year-old Sister of Notre Dame, Dorothy Stang, was used to living among people who wanted her dead. She had long been trying to protect peasant laborers from exploitation by logging firms and ranchers. One day, while walking to a meeting of poor farmers near the town of Anapu in the western Brazilian state of Parà, two armed men intercepted her on the path. She knew what they were there to do. Taking out her Bible, she began reading to them and, for a precious few minutes, they listened before opening fire. Sr. Stang was shot six times in the head, throat, and body. Dying for Christ seems almost surreal to most Westerners. We live in a part of the world where Christianity rarely makes the news unless it is to be mocked or defamed. Otherwise, the media is strangely silent about modern Christian martyrdom. “Three things distinguish anti-Christian persecution and discrimination around the world,” said Denver’s Archbishop Charles Chaput to the U.S. Commission on International Religious Freedom. “First, it’s ugly. Second, it’s growing. And third, the mass media generally ignore or downplay its gravity.” The Bloodiest Century The secular West has been looking the other way for a very long time. Even the average church-going Christian is not likely to know that 45.5 million of the estimated 70 million Christians who have died for Christ did so in the last century. He established a special Jubilee Year Commission on New Martyrs to collect these stories, which resulted in the publication of the names of more than thirteen thousand Catholic, Orthodox, and Protestant martyrs of the faith. Do you think Catholics believe in ghosts and supernatural and paranormal incidences? Of all that is seen and unseen..."
Anyone with other views? Shout into the cbox. Hey everyone! 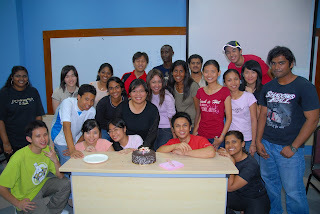 Next up for Catholic youths in the KL region, the Love and Life 2008 camp. So, if you're 17-22 years of age (non muslim) , and if you're free during the dates above, do consider registering yourself before the 20th of November 2008.
or e-mail cssucsi@gmail.com for a copy of the registration form. (In case you do not receive a reply, do call Samson on the above number. 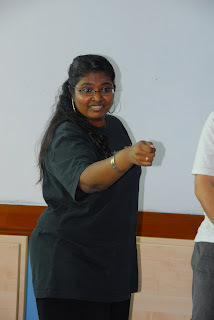 We, from CSSUCSI wishes Daphne a heartiest CONGRATULATIONS and GOOD LUCK in her future undertakings. God will bless your every step! A nurse saw an elderly man who was in the clinic for his check-up early in the morning. He seemed like he was in a rush, fidgeting over his seat, constantly checking his watch for the time. She sat down beside him, and said, "Excuse me, sir, are you alright?" The man replied, "How long more do I have to wait? I must rush off to somewhere." The nurse, wondering what could be so important to this elderly man, who looked like he has retired from the workforce long time ago, answered, "Just a little while longer. What is the rush?" "Well, I have to go to the nursing home. It is almost time that I have my breakfast with my wife. You see, she has been in the nursing home for the past 4 years. She has Alzheimer's disease, and my children decided that it will be best if she had constant care in a home. I was against it naturally, but my health is also taking a toll on me and I have no other choice." The nurse, stunned, replied, "I see. Will she mind if you're late a little while? I mean she does not know who you are anymore, and your routine health check is much more important than the breakfast. If you're late for a while, it would be OK right?" The man looked at her, and a weak smile came across his face. "She does not know me, but I know her. How can I abandon her? It might be a simple breakfast to you, but it means a lot to me, to be with my wife." Moral of the story #1: God is like that. You might not know him, but he knows you. And he cares for you, when you're up, and when you're down. Most of us only seek him when we're bedevilled with problems and sadness and uncertainties. "Where are you, Lord, have you forsaken me?" was Jesus' reply on the cross. He's always there. But when we're filled with joy, seldom it comes to our mind to thank Him. Nonetheless, like the elderly man, He still cares about you and He's always there for you. Moral of the story #2 : Parallel to the story, this week's gospel touches on the two most important commandments. You shall love the Lord, your God, with all your heart, with all your soul, and with all your mind and You shall love your neighbor as yourself. How can we love something that we cannot see, but hate something that we can? Hypocrisy, right? The first step to love God is to love your neighbour, and yourself. Like the elderly man who did not abandon his wife, we should not abandon our friends...and yet proclaim(loudly) that we love God. You would question this love, wouldn't you? As a sort of farewell meetup before everyone heads their own seperate ways, CSS will be having a CSS day out this Saturday, 25th October 2008. It's just a laidback time to spend with friends, have lunch together, probably a movie (if we have time) and whatever else you wish to do. At the same time, we'll be having a short Planning Session for the 2009 semester. This is your opportunity to voice out your concerns, your ideas, and many more suggestions for activities for the upcoming semester. We will meet up at 10am in the Block A cafeteria and continue on till the afternoon. I know that some of you have been wanting to join our activities or lunches but could not do so because of clases - well this is your chance to give back to CSS and to get together to mingle, make new friends, catch up with the old ones as well as contribute to CSS in 2009! The post below is a heart-warming story about the Catholics in a country, which was extracted from the homily of a priest in Singapore(whose name I do not know). 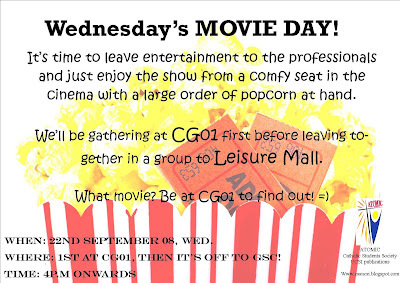 If you are in no hurry, read on; or else, just scroll all the way down to find out next week's CSS event: a movie outing! A 2-dollar-note met a 50-dollar-note in the bank deposit box. The 2-dollar-note said to the 50-dollar-note : "Hey, I haven't seen you around for a long time. Where have you been all these while?" The 50-dollar-note replied, "Well, you know, I've been travelling a lot to many different places in the last 1 year. The casino, McDonalds, Starbucks, Coffee Bean. I've also been to Pavillion, the Gardens Midvalley and 1 Utama also. Seen loads of things and loved the smell of the roasted coffee beans in Starbucks. Well, enough about me, how about you 2-Dollar-Note?" "Oh me? Well, nowhere as interesting as yours. You know, to church, then to the bank, then to the UCSI cafeteria, then back again to St. Francis of Assisi church. Mostly in the church collection box." The 50-dollar-note replied unenthusiastically : "Oh, I see. Well, that's... boring..."
Just then, the cashier seperated the 50-dollar-note into another collection box, while the 2-dollar-note was passed on to a guy at the counter. Well, isn't this a depiction of real-life scenario? We'd actually pay 20 bucks for a cuppa of (sometimes over-rated) coffee, while only 2 dollars goes into the church weekly collection box? Now, the priest's(and I agree with it) point is not that we cannot indulge in a little "gluttony", however, when we reflect the kind we give back to the church, it definitely pales in comparison. And I'm not just talking about cash, even our effort. In our daily hectic life, somehow, God is pushed down our to-do-list. Our support to the parish(and CSS) is mostly a weekly, weekend thing. The other times, we are just too busy with our life. Now, have we ever stopped, and reflect, and to thank God of all the good(and bad) things that has happened to us daily? 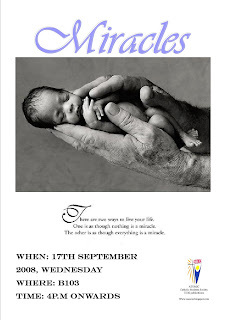 Minor things which make us grow as an individual and as a Christian? 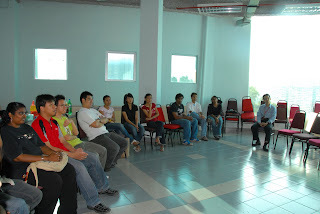 And for this week's event, it's to Cheras Leisure Mall!!! Time to kick back your sandals and take your mind of your exams. 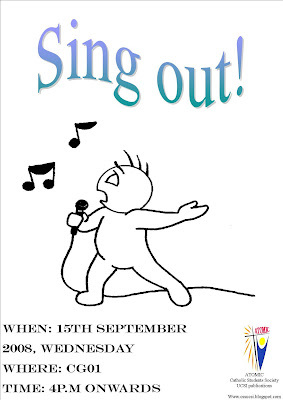 Come join us this Wednesday, 15th October 2008 at CG01 for a session of music, praise, fun, and interaction! We start at 4pm but if you have class, just come along after that! CSS of University Tenaga Nasional cordially invites all CSS under KLCC for our Examination Mass which will be held at COIT (College of Information Technology) UNITEN at 12.45pm on Friday 10th October 2008. Do not hesitate to contact Joshua Thong 016-9353236 for further information pertaining the venue. All are welcomed. Refreshments will be provided after mass. 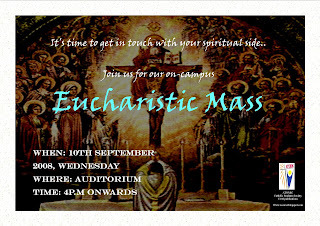 Please feel free to bring more people to celebrate mass and fellowship together. Catholics who have signed up to a social networking site received a message from Pope Benedict in their inbox on Monday. 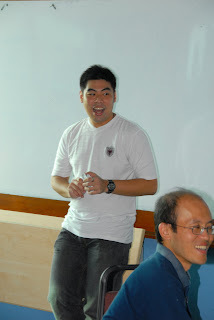 Xt3.com – which stands for Christ in the third millennium – was launched for World Youth Day in Australia in July. Since then, more than 35,000 people from 170 countries have signed up to the site. Pope Benedict’s message asked for prayers for his visit to France this weekend and also praised the faith of young Catholics. Mr Toone said the site had started as the official social network for World Youth Day Sydney 2008 and that its ongoing focus was to “bring people together from all around the world who want to share their experiences, support each other and work together to build a better world”. The site has all the usual functions of a social networking site such as profile pages, friends, photos, discussion groups and events. But it also includes projects and prayer intentions and provides a worldwide diocesan structure with a homepage for each diocese. In addition, it has a section where users can ask a priest questions on any subject. “All importantly, the site is covered by 24/7 moderation to ensure that Xt3 remains a safer and more secure environment,” Mr Toone added. 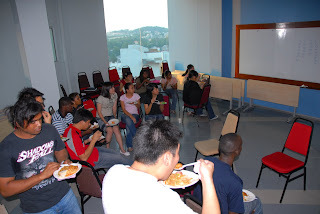 First up was a movie session on the Miracles of Jesus. This gathering, which was a last-minute substitution for our Campus Mass (we couldn't manage to get a priest since most of them were away or had prior commitments) . The movie (or shall i call it documentary?) basically examined three miracles of Jesus - the multiplication of loaves and fishes, the walking on water, and the resurection of the widow's son - and attempted to replicate these miracles using modern day technology, to see if these happenings really were miracles or not! Ooo, a point to note: the whole documentary was done by a team of Christians! This was the main point which led to a debate on whether the documentary was biased or not. Opinions were raised as to whether they would have been more particular in trying to prove the miracles wrong or otherwise. 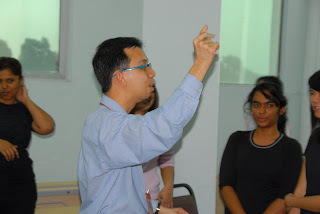 The following week was a talk on Miracles (yup, a follow-up) by a guest speaker, Mr Paul Sebastian from the church of St Joseph, Sentul. Mr Paul gave us a living testimony about his life and how he had been touched by God in various ways through miracles, and how he himself had witnessed miracles occuring to himself, his family, and others around him. 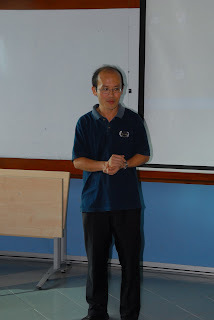 He also explained to us how to distinguish a miracle from one which is done by black magic, bomohs, or paranormalists. thats not all we did this month! stay tuned for the next update - where we had our first ever Sporty Session! Oo, and a very SELAMAT HARI RAYA to all our Muslim friends! We have to back-track to the CSS meeting before our First Birthday Party. It was a planning session for the gala celebration which will be held the following week. And, there were two new faces with us on that day. Both of them are Nursing Students who'd just check into UCSI. I was busy doing some writing(can't remember what I wrote la...I just know that I was distracted at that time). Patricia, as we do with new members, asked each and everyone of us to introduce ourselves. The rounds came and went until the two new members. I heard one of them saying that : "I'm Kim and I'm doing nursing." Alright, my cerebral hemisphere registered that. However, I missed the other girl's name. Hmmm..either I missed, or my brain registered her name as STEPHANIE. Thus, this girl's name has always been Stephanie. Until, one day, well, about 5 days ago. I met Rebecca outside B101 and we started chatting about CSS meetings. (I've been unable to make it for the past few gatherings, so just wanted to find out what's going on there...) And Rebecca said, "You'd know CLARE, right?" "Nope, I don't know Clare. Maybe will meet her in the coming meeting. Which one is she, ah?" "Nope, don't think I've met her before lah..."
Stephanie Stephanie Stephanie. Until...a dinner in McD. I was filling my saucer with ketchup when Stephanie walked in. Then she went, "Eh, Rebecca said you don't know who I am..."
Then, I said, "Noo...I know who you are la...", turned around and walk away. That was when I received WAHYU/epiphany/enlightenment/or my hypothalamus just snap back together again. OMG(gosh, not God, it'll be using God's name in vain). Haha, so, to Stephanie, I mean, Clare...hahaha....I do know you, just that your name was registered as Stephanie! Hahaha... no hard feelings, ok? Moral of the story #3 : There is no Stephanie in CSS.......right? Moral of the story #4 : Pay attention, pay attention, pay attention. Don't multitask(even for the girls...). See what happened?? Anyway, have a good laugh everyone! Now I know who's Clare. The question is, "Do you know who's Clare?" The photo caught your attention, eh? Hope to see you there, ya! And here's the rest of the interview. Time: What is the saddest place you've ever visited? Mother Teresa: I don't know. I can't remember. It's a sad thing to see people suffer, especially the broken family, unloved, uncared for. It's a big sadness; it's always the children who suffer most when there is no love in the family. That's a terrible suffering. Very difficult because you can do nothing. That is the great poverty. You feel helpless. But if you pick up a person dying of hunger, you give him food and it is finished. Time: Why has your order grown so quickly? Mother Teresa: When I ask young people why they want to join us, they say they want the life of prayer, the life of poverty and the life of service to the poorest of the poor. One very rich girl wrote to me and said for a very long time she had been longing to become a nun. When she met us, she said I won't have to give up anything even if I give up everything. You see, that is the mentality of the young today. We have many vocations. Time: There's been some criticism of the very severe regimen under which you and your Sisters live. Mother Teresa: We chose that. That is the difference between us and the poor. Because what will bring us closer to our poor people? How can we be truthful to them if we lead a different life? If we have everything possible that money can give, that the world can give, then what is our connection to the poor? What language will I speak to them? Now if the people tell me it is so hot, I can say you come and see my room. Mother Teresa: Much hotter even, because there is a kitchen underneath. A man came and stayed here as a cook at the children's home. He was rich before and became very poor. Lost everything. He came and said, "Mother Teresa, I cannot eat that food." I said, "I am eating it every day." He looked at me and said, "You eat it too? All right, I will eat it also." And he left perfectly happy. Now if I could not tell him the truth, that man would have remained bitter. He would never have accepted his poverty. He would never have accepted to have that food when he was used to other kinds of food. That helped him to forgive, to forget. Time: What's the most joyful place that you have ever visited? Mother Teresa: Kalighat. When the people die in peace, in the love of God, it is a wonderful thing. To see our poor people happy together with their families, these are beautiful things. The real poor know what is joy. Time: There are people who would say that it's an illusion to think of the poor as joyous, that they must be given housing, raised up. Mother Teresa: The material is not the only thing that gives joy. Something greater than that, the deep sense of peace in the heart. They are content. That is the great difference between rich and poor. Time: But what about those people who are oppressed? Who are taken advantage of? Mother Teresa: There will always be people like that. That is why we must come and share the joy of loving with them. Time: Should the Church's role be just to make the poor as joyous in Christ as they can be made? Mother Teresa: You and I, we are the Church, no? We have to share with our people. Suffering today is because people are hoarding, not giving, not sharing. Jesus made it very clear. Whatever you do to the least of my brethren, you do it to me. Give a glass of water, you give it to me. Receive a little child, you receive me. Clear. Time: If you speak to a political leader who could do more for his people, do you tell him that he must do better? Mother Teresa: I don't say it like that. I say share the joy of loving with your people. Because a politician maybe cannot do the feeding as I do. But he should be clear in his mind to give proper rules and proper regulations to help his people. Time: It is my job to keep politicians honest, and your job to share joy with the poor. Mother Teresa: Exactly. And it is to be for the good of the people and the glory of God. This will be really fruitful. Like a man says to me that you are spoiling the people by giving them fish to eat. You have to give them a rod to catch the fish. And I said my people cannot even stand, still less hold a rod. But I will give them the fish to eat, and when they are strong enough, I will hand them over to you. And you give them the rod to catch the fish. That is a beautiful combination, no? Time: Feminist Catholic nuns sometimes say that you should pour your energy into getting the Vatican to ordain women. Mother Teresa: That does not touch me. Time: What do you think of the feminist movement among nuns in the West? Mother Teresa: I think we should be more busy with our Lord than with all that, more busy with Jesus and proclaiming His Word. What a woman can give, no man can give. That is why God has created them separately. Nuns, women, any woman. Woman is created to be the heart of the family, the heart of love. If we miss that, we miss everything. They give that love in the family or they give it in service, that is what their creation is for. Time: The world wants to know more about you. Mother Teresa: No, no. Let them come to know the poor. I want them to love the poor. I want them to try to find the poor in their own families first, to bring peace and joy and love in the family first. Time: Malcolm Muggeridge once said that if you had not become a Sister and not found Christ's love, you would be a very hard woman. Do you think that is true? Mother Teresa: I don't know. I have no time to think about these things. Time: People who work with you say that you are unstoppable. You always get what you want. Mother Teresa: That's right. All for Jesus. Time: And if they have a problem with that? Mother Teresa: For example, I went to a person recently who would not give me what I needed. I said God bless you, and I went on. He called me back and said what would you say if I give you that thing. I said I will give you a "God bless you" and a big smile. That is all. So he said then come, I will give it to you. We must live the simplicity of the Gospel. Time: You once met Haile Mariam Mengistu, the much feared communist leader of Ethiopia and an avowed atheist. You asked him if he said his prayers. Why did you risk that? Mother Teresa: He is one more child of God. When I went to China, one of the top officials asked me, "What is a communist to you?" I said, "A child of God." Then the next morning the newspapers reported that Mother Teresa said communists are children of God. I was happy because after a long, long time the name God was printed in the papers in China. Beautiful. Time: Are you ever afraid? Mother Teresa: No. I am only afraid of offending God. We are all human beings, that is our weakness, no? The devil would do anything to destroy us, to take us away from Jesus. Time: Where do you see the devil at work? Mother Teresa: Everywhere. When a person is longing to come closer to God he puts temptation in the way to destroy the desire. Sin comes everywhere, in the best of places. Time: What is your greatest fear? Mother Teresa: I have Jesus, I have no fear. Time: What is your greatest disappointment? Mother Teresa: I do the will of God, no? In doing the will of God there is no disappointment. Time: Do your work and spiritual life become easier with time? Mother Teresa: Yes, the closer we come to Jesus, the more we become the work. Because you know to whom you are doing it, with whom you are doing it and for whom you are doing it. That is very clear. That is why we need a clean heart to see God. Mother Teresa: I just take one day. Yesterday is gone. Tomorrow has not come. We have only today to love Jesus. Time: And the future of the order? Mother Teresa: It is His concern. 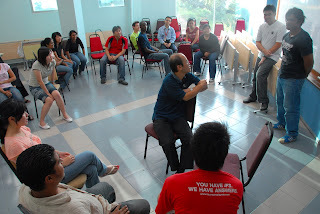 Remember during our retreat at Genting when we agreed to post things up on the blog? Well, I'll start the ball rolling by posting an interview with Mother Teresa (my dad sent this to me sometime ago). It's pretty long so I'm posting it into 2 parts (^ ___ ^). Time: What did you do this morning? Time: When did you start? Mother Teresa: We try to pray through our work by doing it with Jesus, for Jesus, to Jesus. That helps us to put our whole heart and soul into doing it. The dying, the cripple, the mental, the unwanted, the unloved they are Jesus in disguise. Time: People know you as a sort of religious social worker. Do they understand the spiritual basis of your work? Mother Teresa: I don't know. But I give them a chance to come and touch the poor. Everybody has to experience that. So many young people give up everything to do just that. This is something so completely unbelievable in the world, no? And yet it is wonderful. Our volunteers go back different people. Mother Teresa: I never think like that. Time: But don't you think the world responds better to a mother? Mother Teresa: People are responding not because of me, but because of what we're doing. Before, people were speaking much about the poor, but now more and more people are speaking to the poor. That's the great difference. The work has created this. The presence of the poor is known now, especially the poorest of the poor, the unwanted, the loved, the uncared-for. Before, nobody bothered about the people in the street. We have picked up from the streets of Calcutta 54,000 people, and 23,000 something have died in that one room [at Kalighat]. Time: Why have you been so successful? Mother Teresa: Jesus made Himself the bread of life to give us life. That's where we begin the day, with Mass. And we end the day with Adoration of the Blessed Sacrament. I don't think that I could do this work for even one week if I didn't have four hours of prayer every day. Time: Humble as you are, it must be an extraordinary thing to be a vehicle of God's grace in the world. Mother Teresa: But it is His work. I think God wants to show His greatness by using nothingness. Mother Teresa: I'm very sure of that. Mother Teresa: I don't think so. I don't claim anything of the work. It's His work. I'm like a little pencil in His hand. That's all. He does the thinking. He does the writing. The pencil has nothing to do it. The pencil has only to be allowed to be used. In human terms, the success of our work should not have happened, no? That is a sign that it's His work, and that He is using others as instruments - all our Sisters. None of us could produce this. Yet see what He has done. Time: What is God's greatest gift to you? Mother Teresa: The poor people. Time: How are they a gift? Mother Teresa: I have an opportunity to be with Jesus 24 hours a day. Time: Here in Calcutta, have you created a real change? Mother Teresa: I think so. People are aware of the presence and also many, many, many Hindu people share with us. They come and feed the people and they serve the people. Now we never see a person lying there in the street dying. It has created a worldwide awareness of the poor. Time: Beyond showing the poor to the world, have you conveyed any message about how to work with the poor? Mother Teresa: You must make them feel loved and wanted. They are Jesus for me. I believe in that much more than doing big things for them. Time: What's your greatest hope here in India? Mother Teresa: To give Jesus to all. Time: But you do not evangelize in the conventional sense of the term. Mother Teresa: I'm evangelizing by my works of love. Time: Is that the best way? Mother Teresa: For us, yes. For somebody else, something else. I'm evangelizing the way God wants me to. Jesus said go and preach to all the nations. We are now in so many nations preaching the Gospel by our works of love. "By the love that you have for one another will they know you are my disciples." That's the preaching that we are doing, and I think that is more real. Time: Friends of yours say that you are disappointed that your work has not brought more conversions in this great Hindu nation. Mother Teresa: Missionaries don't think of that. They only want to proclaim the Word of God. Numbers have nothing to do with it. But the people are putting prayer into action by coming and serving the people. Continually people are coming to feed and serve, so many, you go and see. Everywhere people are helping. We don't know the future. But the door is already open to Christ. There may not be a big conversion like that, but we don't know what is happening in the soul. Time: What do you think of Hinduism? Mother Teresa: I love all religions, but I am in love with my own. No discussion. That's what we have to prove to them. Seeing what I do, they realize that I am in love with Jesus. Time: And they should love Jesus too? Mother Teresa: Naturally, if they want peace, if they want joy, let them find Jesus. If people become better Hindus, better Moslems, better Buddhists by our acts of love, then there is something else growing there. They come closer and closer to God. When they come closer, they have to choose. Time: You and John Paul II, among other Church leaders, have spoken out against certain lifestyles in the West, against materialism and abortion. How alarmed are you? Mother Teresa: I always say one thing: If a mother can kill her own child, then what is left of the West to be destroyed? It is difficult to explain , but it is just that. Time: When you spoke at Harvard University a few years ago, you said abortion was a great evil and people booed. What did you think when people booed you? Mother Teresa: I offered it to our Lord. It's all for Him, no? I let Him say what He wants. Time: But these people who booed you would say that they also only want the best for women? Mother Teresa: That may be. But we must tell the truth. Mother Teresa: We have no right to kill. Thou shalt not kill, a commandment of God. And still should we kill the helpless one, the little one? You see we get so excited because people are throwing bombs and so many are being killed. For the grown ups, there is so much excitement in the world. But that little one in the womb, not even a sound? He cannot even escape. That child is the poorest of the poor. Time: Is materialism in the West an equally serious problem? Mother Teresa: I don't know. I have so many things to think about. I pray lots about that, but I am not occupied by that. Take our congregation for example, we have very little, so we have nothing to be preoccupied with. The more you have, the more you are occupied, the less you give. But the less you have the more free you are. Poverty for us is a freedom. It is not a mortification, a penance. It is joyful freedom. There is no television here, no this, no that. This is the only fan in the whole house. It doesn't matter how hot it is, and it is for the guests. But we are perfectly happy. Mother Teresa: I find the rich much poorer. Sometimes they are more lonely inside. They are never satisfied. They always need something more. I don't say all of them are like that. Everybody is not the same. I find that poverty hard to remove. The hunger for love is much more difficult to remove than the hunger for bread. CSS UCSI is starting a fresh new semester. 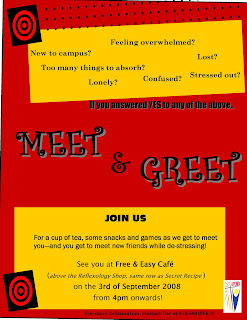 For those of you freshies, don't worry, come and join us in Free & Easy cafe on the 3rd of September 2008 from 4pm onwards. All are invited, catholic or non-catholic, as this is a get-to-know session! Look what I found on the internet! (sorry people, since the moderator is going to study dentistry, this has some dental elements!) Saint Apollonia is the Saint of Dentistry! Similar to our Patron Saint, Saint Aloysius Gonzaga(refer to August 2007 post), Saint Apollonia is regarded as the patron saint of dentistry because ... well, read this article taken from Wikipedia. "Saint Apollonia was one of a group of virgin martyrs who suffered in Alexandria during a local uprising against the Christians prior to the persecution of Decius. According to legend, her torture included having all of her teeth violently pulled out or shattered. For this reason, she is popularly regarded as the patroness of dentistry and those suffering from toothache or other dental problems." "At that time Apollonia, parthénos presbytis (by which he very probably means not a virgin advanced in years as is generally reported, but a deaconess) was held in high esteem. These men seized her also and by repeated blows broke all her teeth. They then erected outside the city gates a pile of fagots and threatened to burn her alive if she refused to repeat after them impious words (either a blasphemy against Christ, or an invocation of the heathen gods). Given, at her own request, a little freedom, she sprang quickly into the fire and was burned to death." "The Eastern Orthodox and Roman Catholic Churches celebrate the feast day of St. Apollonia on February 9, and she is popularly invoked against the toothache because of the torments she had to endure. She is represented in art with pincers in which a tooth is held." "The island of Mauritius was originally named Santa Apolonia in her honor in 1507 by Portuguese navigators." If you all want to know any other Patron Saints, or find out about the meaning of your names etc., shout it loud in the cbox. And they're off to Dominic Villa, Genting Highlands(or rather, at the foot of Genting!). Look at Byron, the face of JOY for this planning camp. 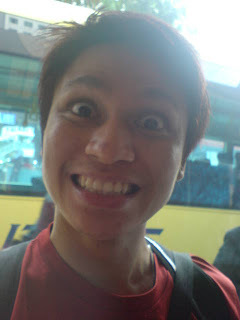 This was taken just before they boarded the bus to Genting. More will be post up later about the gist of the planning camp! CSS will be having a planning camp for it's members soon. 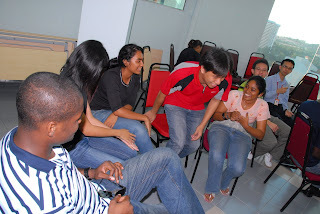 We're going to have an interactive session planning events for the next semester as well as have FUN in Genting! Don't worry, CSS takes into consideration the tight budget we're living on now, and will be cost effective! Do, drop us a comment either at the end of this post or on the cbox to air your views! We really want to hear from you...FAST! I've got a bit of free time so I thought i'd share with you some thoughts n reflections of WYD 2008. The first thing I realized is that faith is a life-long learning experience. Well, so is everything else, but this aspect really struck me when I got here and was exposed to so many things. You learn a little more about faith each day. Not faith as faith only in the bible or what you learn from Catechism, but faith thru actions and real life. If I were to complain about a 13 hour journey to Australia, there were people who took 35 hours to get there. If one were to complain about the tremendous amount of walking around, you should have seen the people who came in wheelchairs and crutches. Faith is such an amazing thing to unite all together. I tell you, although there were about half a miliion people around, all with different languages and cultures, the one thing which united us all was Jesus, and this was indeed one of the experiences I treasure. And seeing all these people, the same age as us, who probablly face the same challenges as we do in our lifes, but living it all up for God - that makes me realize that we should never ever give up. The same thing with CSS. It's our mission to live out a Christian life, and to witness to others. Being a witness was one of the major aspects that Sydney ppl got to experience. They remarked that Catholics were so cheerful, smiley, happy - and never complained! Hmm, an example. While working as a volunteer, there were days when there were communication breakdowns within the gates (25 gates!) So it happened that people who had to go thru Gate 1 were told to go to Gate 3 and cut thru..but Gate 3 was closed and so these poor people had to walk all the way back to my gate (Gate 24 - right at the other end!) and go thru another way to get to their gate. We're talking about almost 1.5 times the length of the pasar malam in cheras - one way! :S I mean, i imagined these people were gonna be so pissed and annoyed, and my teammates and I at the gates kept on apologizing. But they just laughed and said its ok, and they grabbed their bags, started singing and continued walking on. Now in my opinion, thats the true Catholic spirit!! So yeah, never give up. You know how I used to be really worried about our attendance at gatherings? Now I know that instead of mainly worrying and fretting, we should just be living witnesses. And that's whats gonna matter in the end. Not our numbers, (it does count a bit too la!) but lets all work together to bring the message of Christ to our campus. ps: the pope says to focus on inter-ecumenical discussions! 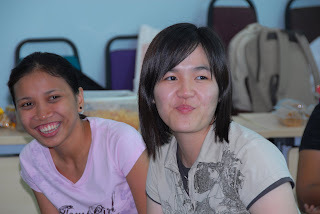 First note : Take care Sue, have a great time in Sydney during the World Youth Day! If you're seeing this post from Sydney, remember the CSS members in UCSI...as well as tokens from WYD(for us)! Ha! More details about the theme etc. will be announced in the week to come. 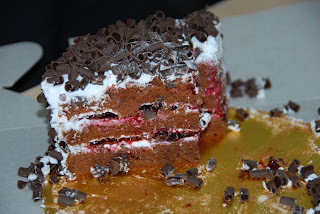 So check out the blog regularly! Third Note : This week's Gospel touches on the PARABLE OF THE SOWER. With initial steps to increase spread our faith, I will share a thing or two as spoken by Fr. 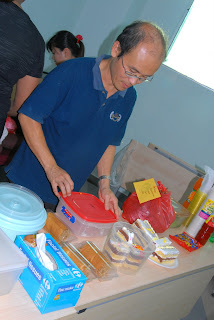 Lawrence Andrew of the St. Anne's Church, Klang. This parable can be said to represent the whole world, as well as individually. Let us take a look at it from both perspectives. God is the sower in this case. And the Earth is the place where the seeds are sown. If you look around us, there're large pockets of where Christianity has flourished, then whithered. Turkey for example, the birthplace of St. Paul(Tarsus in Turkey is the exact birthplace), was once a Christian community, but now majority of the citizens are Muslims. It can be said that, God sowed the seeds to these places, but, to quote : "Some fell on rocky ground, where it had little soil. It sprang up at once because the soil was not deep, and when the sun rose it was scorched, and it withered for lack of roots." Upon challenges and hardships, Christianity whither in places like Turkey. Yet in other, such as, Mexico, Brazil, and Italy, Christianity is flourishing. But does it mean, if we're on "rocky ground" or "among thorns", we are doomed to fail as Christians? The first question to ask is not as above, instead it is: "Are we seeds of God?" We, as Catholics(or Christians in general) have to ponder whether are we willing to "take up the cross and follow him". How have we developed by faith since the end of our Sunday school era(yay!)? Have our actions reflected God's words? If indeed, we decide, that we are the seeds of God, the next question is: "What can we do to grow, even among thorn bushes and rocky ground?" As seeds need water to germinate, and plants need sunlight to grow, how are we going to grow by faith as Christians? Read the word of God, stick to the 10 Commandments are a few that I can think of. "So, we will grow by doing these even if we're placed in places like Turkey?" The answer, I think, is yes. There're Christian communities even in countries largely populated by other religion. And the simple reason that they exist, is faith to God. Fourth note : cssucsi.blogspot.com will be rolling out the new information of the new committee soon. Do be patient with me. Thanks. Woah. It's only the 5th note and I ran out of things to say. How am I going to break the record of the longest piece of musical note ever composed? p.s. The longest musical piece ever composed is »Organ2/ASLSP« by American composer/artist John Cage (1912-1992). The piece ends after 639 years, on September 4, 2640. Now, that's something! "Catholics only know Christ as the beautiful statue in church. Christ is no longer in CSS and that is why we are unable to attract members to come for meetings. Prayer is not being taken seriously. And a large majority of catholics(in UCSI) have a wrong idea on what faith is." Is Christ no longer in CSS? Is that the reason why we are unable to attract members? CSS has had a difficult time balancing what its members want. Fun, God, knowledge, Praise and worship and friends. Nonetheless, every activity we had, we've put God an element in the event. The talks we had to do with knowledge on the Bible and on our faith. Praise and worship always centred around God. Rosary is for the devotion to Mother Mary. Fun, well, maybe it doesn't have anything to do with God, but it bonds us closer. Now, to examine whether is Christ no longer in CSS, we have to look back at our meetings. Yes, the meetings were mostly God-centred. How about the members? Most who came were definitely eager to find out about Christ. I mean, I was eager to find out about the book of Revelation, and Advent and everything. It is a way of strengthening my faith. Prayer is not being taken seriously? A large majority of catholics(in UCSI) have a wrong idea on what faith is? Faith. How many of us have enough idea on faith? Jesus said if we had faith as big as a mustard seed, we can move mountains. So, how much faith do we actually have? And what is our idea of faith? Interestingly, today's sermon by Fr. 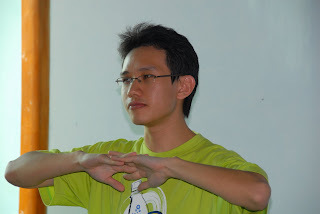 Joachim Tan of HRC, Klang, that God does not put intellectual knowledge first. We can read and quote the whole Bible, but if we don't understand the essence of it, what use is the knowledge? I believe that, with the faith we have, we should go about practising it. Keep to the 10 commandments. Respect fellow beings. I am not ashamed to say that my knowledge of the Bible is pretty, well, trivial. And also of the catholic faith. But at the age of 18,(yes, the moderator is THIS old) how much faith can we expect to have? Even people who have been catholics for 50 years don't have the faith of a mustard seed. Faith is an on-going process, we learn a little by little throughout life. Idea about faith? As long as it has to do with God, don't we call that faith? cssucsi.blogspot.com wishest a warm welcome to PATRICIA, TOMI, JOANNE, NICHOLAS and AMANDA! 4. If you could turn back time, what would you have changed in CSS? Nothing. I am thankful with my committee members and saw every challenge as God's will and we are to go through it together. No regrets in this point. If it is not due to the past you would not have a future.Wanting to change the past in this mater is like not acknowledging one's mistake and not wanting to learn from it but wanting an easy way out to clear things. Not good. 5. How have each and every CSS committee grown since one year ago? I feel all of them has learnt something of which you will have to ask them yourselves haha. However I believe they have become more mature by acquiring or brushing up their leadership skills and faith, becoming better. Nevertheless I also feel there are some who have missed out a bit haha. For me I have gained more experience in organization, PR and of course more knowledge of our faith through our gatherings which many have missed haha for not coming. 6. What do you want CSS members to benefit from the CSS gatherings? Are there aims or objectives for each gathering? ATOMIC has its aims and objectives but basically we want the members to learn more about our faith in a higher level more than what has already been thought in church and the same time to form a circle of friends which will be quality witnesses of Christ in the university. 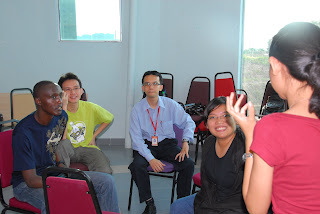 Also to grow in faith together while being students trying to lead a Cristian life hence. It needs some sort of dedication and love in doing God's work and wanting to learn to really follow His ways and thus serving the people around. Thats what makes us different from all other societies (non-religious). The people in CSS will have to learn how to sacrifice a little. Jesus sacrificed himself for us, did he not? So why not we make some sacrifice too for the benefit of others. There is nothing to loose but only gains. 9. As the outgoing president, do you have anything else to say to the new president? 10. It must have been hard typing everything using CORRECT english grammar and so forth. (Haha...payback for all the emails you sent.) Anything to comment or justify to this? I have no problem in my English - grammar and spelling. I type fast and i have many things to do so i don't check. Pardon me for that haha. For the many mails is because I don't have a computer myself and i do not know when i will get one then, so the moment something pops up my head and i want all to know i send a mail if not i forget too. Also i send many, is to inform all EXCO what is happening so later there would not be any excuse of not knowing what is going on. (Although the result is not 100%) Again this is not one way leadership. Everyone will have to know what others are doing only then it is easier to coordinate certain things while organizing stuff. I have enjoyed myself being the president or some would call me the Chair @ Kerusi hahaha (chairman) for the past one year. I have learnt a lot and made many friends within the university and also in other universities and without CSS i would not be able to do so. Without CSS i would not have a soul but might become more of a robot being churned out from the university. The experience gained i am very grateful and happy for, and i know that these experiences will definitely help me in future. I would like to take this opportunity to thank my EXCOs who are all good in their own ways and in their work. Sue, Bridgette, Byron, Ivan, Paul, Rebecca and the rest keep up the good work in the coming term and keep CSS alive.Lastly my sincere apologies if during my tenure as president i have hurt anyone through my actions or words. 1. 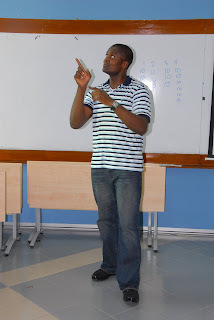 Tell us about the beginning, how did you join CSS and how were you made the 1st President of CSS. Well it was unexpected. I thought a CSS did not exist and i actually told Ivan there was none when he asked me. Then one day Ivan came up to me pula and said there was one and yup we were both excited.We went to one of the members house one night and realized it was a first gathering hahahaha. Both of us thought the group existed ages a go.. Ms June was leading the group and told us that contact has been made with Lifeline Ministry of SFX so we are hooked to themlah. 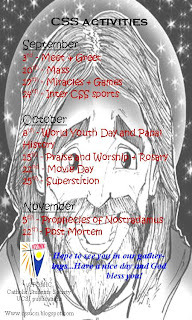 Dunno how i got the first task to organize the following weeks' gatherings' activity and it was about Angels. So as usual, I went back and got into business but unfortunately something came up and i did not attend that gathering but I passed my work and it was carried out together with a short movie screening and sharing too by the rest. After that about 6 gatherings or so were held and i attended only 1.Then came the exam and holiday season and no gatherings were held. To be honest i did not bother also because i myself was busy with medicine. Then came a night where when i was walking back from UCSI to the condo i got a call from an unknown number. Uhmm who could it be?? I asked myself. Bah should be one of my classmates. Rupa rupanya it was Ms June. Ah maybe an invitation to join the next gathering. 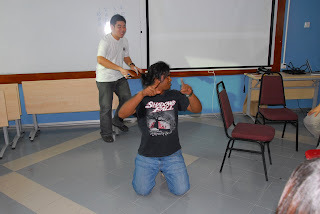 Tengok tengok 'Hey Greg can you take over this group!' she asked me. !!!! I declined and gave reasons for it and asked her too WHY ME??. (She only met me twice during those gatherings - so how can one know me??). She said i was the first to pop up in her mind when thinking this. (?!?!??!) Ms June was sick and could not run the show. I told her i will think first.Hahaha - As i was thinking whether i can take over or not I was already planning how to set up CSS university level and join CMO. While contemplating on this issue i realized myself in ASAYO office asking how to set up a CSS when i was passing by Masjid Jamek one day, while on the way back to my kampung. Then I gathered some counterparts and then had a short meeting with Ms Jennifer from CMO in UCSI. The ball hence started rolling. Forms to set up a society in UCSI were filled and complied too. Some research was done and we got to know that there are many Catholics around and we estimated bout 100. Ivan was a good fisherman and with his findings we decided to have an AGM. Well the turn out was poor and we realized our publicity was not strong enough so for the next 2 week we worked hard in publicity and the next AGM we saw 30 people turned out for it. Wohooo. And walla I became the first president. (I was still in contemplating mode haha). Before all these events Fr. Valentine told Ivan and I that he wanted to see a CSS in UCSI. Hehe i did not feel wanting to take the initiative set up one also at that time. Guess his prayers were answered.Well God works in wonders and I was a Jonah here hahaha, finally stoped contemplating and said to myself "Woi!! You are the Pressie here and it is for a reason and a CSS is here also for a reason so get into business!!!". YOUR will be done. Without anymore hesitation i jumped into the building of the CSS here together with my new committee. 2. 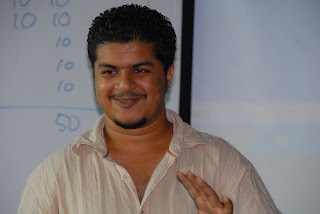 In the early part of CSS gathering, what were the obstacles that you faced as the President? Have these obstacles been resolved as you leave? Well the first obstacles was getting everyone organized and 'into' CSS and that has been resolved and going well till now. 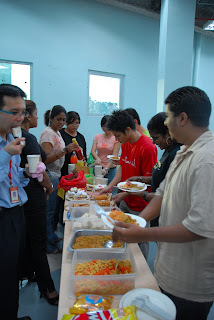 Then it was finding a proper time to maximize the number of members and excos to attend each gathering. Won at times but till know it has not 100% resolved. UCSI timetables are not standardized and at every moment some one will either be having their exams, holidays or what so ever in uni. The number of attendance was fluctuating from as low as 4 to as high as 25 (normal gatherings excluding mass). Next is people themselves who are difficult. Always give false hope and information hampering the EXCO's to do their job. Efficiency, responsibility, sincerity, sacrifice is quiet lacking as well as the will to explore and learn and to grow and mature in the faith. We are trying to change this through many ways but you know we only can bring the horse to the river but for it to drink is left up to the horse. The other, is excuses, unreasonable ones....haish... . Well we cant force but we are still with our doors open and inside it there is much to gain which I feel bad as it is not reaching the members. The chances for a system itself not to work is about 30% the rest is human - 70%. 3. Tell us your best memory of CSS since it's birth almost one year ago. 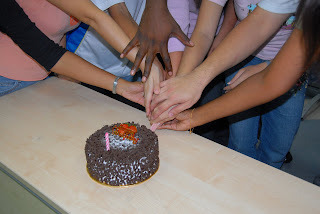 The whole formation of setting up, carrying out and passing over CSS is an unforgettable memory itself. Nothing specific in particular. Experiencing every moment to the fullest whether happy or sad are good memories.